Background: A sensitive and valid non-invasive marker of early cystic fibrosis (CF) lung disease is sought. The lung clearance index (LCI) from multiple-breath washout (MBW) is known to detect abnormal lung function more readily than spirometry in children and teenagers with CF, but its relationship to structural lung abnormalities is unknown. A study was undertaken to determine the agreements between LCI and spirometry, respectively, with structural lung disease as measured by high-resolution computed tomography (HRCT) in children and teenagers with CF. Methods: A retrospective study was performed in 44 consecutive patients with CF aged 5–19 years (mean 12 years). At an annual check-up inspiratory and expiratory HRCT scans, LCI and spirometric parameters (forced expiratory volume in 1 s (FEV1) and maximal expiratory flow when 75% of forced vital capacity was expired (FEF75)) were recorded. Abnormal structure was defined as a composite HRCT score of >5%, the presence of bronchiectasis or air trapping >30%. Abnormal lung function was defined as LCI above the predicted mean +1.96 residual standard deviations (RSD), or FEV1 or FEF75 below the predicted mean −1.96 RSD. Sensitivity/specificity assessments and correlation analyses were done. Results: The sensitivity to detect abnormal lung structure was 85–94% for LCI, 19–26% for FEV1 and 62–75% for FEF75. Specificity was 43–65% for LCI, 89–100% for FEV1 and 75–88% for FEF75. LCI correlated better with HRCT scores (Rs +0.85) than FEV1 (−0.62) or FEF75 (−0.66). Conclusions: LCI is a more sensitive indicator than FEV1 or FEF75 for detecting structural lung disease in CF, and a normal LCI almost excludes HRCT abnormalities. The finding of an abnormal LCI in some patients with normal HRCT scans suggests that LCI may be even more sensitive than HRCT scanning for detecting lung involvement in CF. Spirometry (forced expiratory volume in 1 s (FEV1)) is still the most widely used method for clinical monitoring of CF lung disease, and it is believed to be a good predictor of outcome in patients with moderate to severe CF lung disease.7–9 Over the last two decades there has been a shift towards closer monitoring and more aggressive treatment of early CF lung disease. As a consequence, two major disadvantages of the use of FEV1 in children with CF have become apparent. First, many school-age children with CF now have FEV1 within the normal range10 or show a slow rate of progression,2 10–12 even though they probably have lung disease that progresses faster than is reflected in spirometric measurements. Apparently FEV1 is not very sensitive to early CF lung disease.13–15 Second, reliable forced expiratory manoeuvres are difficult to obtain in children under the age of 5 years, with testing in the infant and preschool age groups being largely confined to specialist laboratories.16–18 As interest in monitoring younger patients increases, so does the need for alternative more sensitive measures of CF lung disease that can be obtained in children of all ages. It has recently been suggested that the lung clearance index (LCI), an index of uneven ventilation distribution measured by multiple breath washout (MBW) of an inert marker gas, could be a sensitive early marker of CF lung disease.13–15 18 The MBW method is not new but has been used for over 50 years,41 and paediatric studies were published during the 1960s42 and 1970s.43 Breath-by-breath studies in children using modern PC technology were reported by Wall44 and Kraemer45 more than 20 years ago. LCI has advantages over spirometry in that it can be measured easily in all age groups and normative values are similar from early childhood to adulthood.15 It discriminates between patients with CF and healthy subjects better than either FEV1 or body plethysmography (residual volume/total lung capacity ratio).15 The LCI has also been shown to be an earlier and stronger indicator of disease progression than spirometry.46 Finally, the MBW test is a non-invasive functional measurement which involves no risk or hazardous exposures. The relationship of LCI to structural lung abnormalities in CF has, however, not been reported previously. The present study aimed to assess the correlations between LCI and spirometry and structural lung abnormalities in CF, and to determine their sensitivity and specificity in the detection of bronchiectasis and other structural lung abnormalities as measured by HRCT. It was hypothesised that LCI would agree better with the presence of HRCT abnormalities than spirometry. A retrospective study of spirometry, MBW and HRCT recordings was performed over a 30-month period in 44 consecutive patients with CF aged <20 years. All patients underwent these investigations as part of their routine annual review at the Göteborg CF centre where HRCT is performed routinely every third year in patients over 5 years of age. Chronic colonisation with Pseudomonas aeruginosa was defined as three or more positive cultures over a 6-month period. This retrospective analysis was approved by the ethics committee for human research at the University of Göteborg. Lung structure was evaluated using HRCT scans. The scanning protocol has previously been reported24 and is described in more detail in the online supplement. Briefly, images were obtained from lung apex to base at 15 mm (children) and 10 mm (adults ⩾18 years) intervals using 1.25 mm thick slices in inspiration. In addition, three expiratory HRCT images were obtained through the upper, middle and lower lung zones. Abnormal structure was defined as a composite HRCT score of >5%, the presence of bronchiectasis or air trapping >30%. Lung function was expressed as z-scores which were calculated as (measured value − predicted value)/RSD from the reference population. Abnormal lung function was defined as LCI above +1.96 z-scores or FEV1 or FEF75 below −1.96 z-scores. The proportions of patients with normal or abnormal FEV1 or LCI results in relation to HRCT classifications (cross tabulations) were compared using the Yates corrected χ2 test. The sensitivity and specificity were determined for LCI, FEV1 and FEF75 with respect to an abnormal HRCT composite score, the presence of bronchiectasis and the presence of abnormal air trapping, as diagnosed by HRCT scanning. Sensitivity was calculated as the proportion of the study population with abnormal HRCT findings that showed abnormal lung function results. Specificity was calculated as the proportion of the study population with normal HRCT finding that had normal lung function findings. The 95% confidence intervals (CI) around the sensitivity and specificity findings were calculated as follows: 95% CI for p = p±1.96*SE; SE for p = (p*(1−p)/n)1/2 where p denotes the sensitivity or specificity expressed as a ratio. Spearman rank correlation coefficients (Rs) were calculated for FEV1, LCI and FEF75 with respect to the HRCT composite score, bronchiectasis, mucus plugging, airway wall thickness, parenchyma and air trapping. A p value of <0.05 was accepted as statistically significant. Statistica 6.0 (StatSoft, Tulsa, Oklahoma, USA) was used for the statistical analyses. The study group included 27 males and 17 females aged 5.4–19.6 years (mean and median age 12.2 years). Twenty-one patients (48%) were homozygotes and 19 (43%) were heterozygotes for dF508. Eleven patients were chronically colonised with Pseudomonas aeruginosa and 37 were pancreatic insufficient. FEV1 ranged from 44% to 127% of predicted values (mean and median 95%). Bronchiectasis was diagnosed in 26 patients (59%), an abnormal composite HRCT score (>5%) was found in 27 patients (61%), and pathological gas trapping was present in 16 (36%). Figure 1 gives lung function findings in z-scores versus age. Age was evenly distributed and there was no significant correlation between any lung function parameter and age. 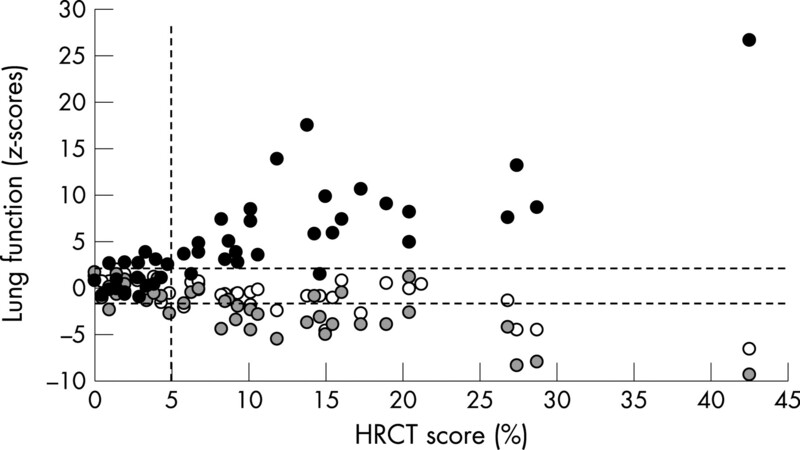 Figure 2 shows lung function in relation to HRCT scores. Of the 27 patients with an HRCT score >5%, 25 had an abnormally elevated LCI, 17 had abnormal FEF75 results and 7 had reduced FEV1. Seventeen patients had normal HRCT scores (⩽5%); 6 of these had elevated LCI, 2 had abnormal FEF75 and all had FEV1 within normal limits. Figure 1 Lung function (lung clearance index (LCI), forced expiratory volume in 1 s (FEV1) and maximal expiratory flow when 75% of forced vital capacity was expired (FEF75)) expressed as z-scores plotted against age in 44 children and teenagers with CF. Black filled circles denote LCI, open circles FEV1 and grey circles FEF75. The horizontal hatched lines denote the upper and lower limits of normality (LLN) for the lung function variables. Figure 2 Lung function (lung clearance index (LCI), forced expiratory volume in 1 s (FEV1) and maximal expiratory flow when 75% of forced vital capacity was expired (FEF75)) expressed as z-scores plotted against HRCT (composite scores) in 44 children and teenagers with CF. Black filled circles denote LCI, open circles FEV1 and grey circles FEF75. Vertical hatched line denotes upper limit of normality (ULN) for HRCT score and horizontal hatched lines denote upper and lower limits of normality (LLN) for the lung function variables. LCI and FEF75 showed closer agreement with findings of structural lung abnormalities than did FEV1 (table 1). The LCI had the best sensitivity (85–94%) for detecting structural lung abnormalities (bronchiectasis, composite HTCT score and air trapping) (table 2). The sensitivity for FEV1 ranged from 19% to 26% and for FEF75 from 62% to 75%. The specificity in the detection of structural lung disease was, however, higher for FEV1 (89–100%) and FEF75 (75–88%) than for LCI (43–65%). The LCI had a markedly stronger correlation with all six structural abnormality scores (Rs 0.65 to 0.85) than did the FEV1 (Rs −0.35 to −0.62) or FEF75 (Rs −0.44 to −0.66) (table 3). The proportion of patients with normal or abnormal FEF75 showed better agreement with LCI classification than did the FEV1 (table 4), but the overall correlation with LCI was similar (FEF75: Rs = −0.66, p<0.001; FEV1: Rs = −0.63, p<0.001). This study aimed to determine the sensitivity of spirometry and MBW for detecting bronchiectasis and other structural lung changes as measured by HRCT scanning in children and teenagers with CF, and to compare the correlations between LCI and spirometry and structural lung abnormalities. The hypothesis was that the LCI would be a more sensitive test for detecting structural lung disease than FEV1 or FEF75, and that LCI would correlate better than spirometry with structural lung changes. It was shown that LCI was markedly more sensitive than either FEV1 or FEF75 with respect to structural lung abnormalities (bronchiectasis, air trapping and combined abnormalities). The sensitivity of LCI ranged between 85% and 94%. Of 27 patients with abnormal HRCT scores, 25 had elevated LCI and 22/26 patients with evidence of bronchiectasis had abnormal LCI, which suggests that a normal LCI in a subject with CF almost excludes structural lung damage. The specificity of LCI was modest, however, because LCI was abnormal in one-third of the patients with normal HRCT scores, half of those without evidence of bronchiectasis, and in more than half of those without diagnosed air trapping. The LCI is a measure of overall ventilation inhomogeneity in the lungs, which occurs at branch points in large or small airways including very small airways close to or within the gas exchange zone.53 Geometric alterations in very small airways due to airway wall thickening or mucus accumulation can result in uneven ventilation distribution, but such alterations may not be detected by HRCT scanning. The LCI may therefore be abnormally elevated in subjects with CF lung disease but lack HRCT evidence of structural lung changes. Another explanation for the somewhat low specificity of the LCI could be that our HRCT protocol might have missed some structural aberrations. Only three expiratory images were obtained, which may limit the ability to detect the full extent of air trapping. In addition, for the inspiratory CT scans there are relatively large gaps of 15 mm between the CT images, which potentially result in underestimation of the structural abnormalities.36 It has recently been shown that bronchiectasis can be missed using an incremental HRCT protocol compared with a full lung HRCT scan.36 54 Conventional HRCT scanning is therefore no longer the ideal method and is now often replaced by full lung CT scans. As expected, the FEV1 had a low sensitivity, making it of little value in early disease detection in CF. This corresponds to previous studies showing structural disease in about 30% of patients with normal spirometric parameters.21 24 25 The better specificity of FEV1 compared with the LCI means that, when FEV1 starts to decline, major bronchiectasis or other structural damage is likely to be present. On the other hand, many patients in the present study who had normal FEV1 or FEF75 results showed evidence of quite advanced structural lung damage. The present study suggests that the FEF75 is considerably more sensitive than FEV1 for detecting structural alterations. This reflects the closer agreement shown between abnormal LCI and FEF75 than FEV1, and supports the common view that FEF75 is more sensitive than FEV1 to small airway disease. Nevertheless, the high frequency of abnormal LCI in CF and the strong correlation between LCI and HRCT abnormalities demonstrate that the LCI is a better indictor of structural lung abnormalities than spirometry. Because this study was cross-sectional, we can only speculate that the LCI will rise in parallel with advancing structural lung alterations in patients with CF who are followed over several years. This important question needs to be addressed in future longitudinal studies. Based on the present findings, it may nevertheless be argued that the MBW test should be used to monitor lung disease in young children with CF. As long as the LCI remains normal, the presence of structural lung abnormalities is unlikely and HRCT scanning is probably of limited value to verify disease progression. Only when the LCI starts to rise may an HRCT scan be needed to confirm disease progression. This could be a dose-saving strategy of particular importance for young children who are more sensitive to radiation. Further investigations are needed, however, before firm clinical recommendations regarding such a strategy can be given. It is acknowledged that both HRCT and LCI should be viewed as potential surrogate outcome markers in CF at this time. Their relationships to the long-term outcome of CF lung disease—as reflected in widely accepted outcome markers such as FEV1 or mortality—are not fully known. Nevertheless, when an aggressive approach to early CF lung disease is evaluated, more sensitive outcomes than FEV1 and mortality are definitely needed. It is unlikely that a bias has influenced the general outcome of the study. The MBW parameters were determined without having information on the CT scan. Furthermore, patient identity, demographic information or lung function findings were not available to the observer scoring the images. Ideally, spirometry, MBW and HRCT scans should have been performed on the same day in a randomised fashion. All investigations were carried out in clinically stable patients during their annual review at the CF centre. They were undertaken on the same day in 26 of the patients (59%), and in all remaining patients but one there was only one day between any of the tests. The patient group included a sample of approximately one-third of all patients with CF attending the CF Center in Göteborg. This sample constituted all consecutive patients over a 30-month period aged <20 years who were investigated with spirometry and MBW as part of their annual review and, in addition, HRCT which is done routinely every third year in patients older than 5 years. There was a slight over-representation of males (61%) in the study population compared with 52% in the entire CF population. The study involved only children and teenagers who could perform spirometric tests and who were aged >5 years because the routine schedule includes HRCT scans only above that age. The relationships between LCI and HRCT abnormalities in younger and older patients therefore remain to be determined. In conclusion, this cross-sectional analysis shows that the LCI is more sensitive than spirometry (FEV1 or FEF75) for detecting structural lung alterations in CF, and that a normal LCI indicates the absence of structural lung damage detectable by HRCT. The usefulness of LCI for detecting progression of CF lung disease compared with HRCT needs to be assessed in longitudinal studies.
. Pathophysiology and management of pulmonary infections in cystic fibrosis.Am J Respir Crit Care Med2003;168:918–51.
. Detecting early structural lung damage in cystic fibrosis.Pediatr Pulmonol2002;34:228–31.
. Long-term survival and nutritional data in patients with cystic fibrosis treated in a Danish centre.Thorax1996;51:1023–7.
. Denmark to the rescue.Pediatr Pulmonol1996;21:151–2.
. Improved survival in the Danish center-treated cystic fibrosis patients: results of aggressive treatment.Pediatr Pulmonol1996;21:153–8.
. Computed tomography in the evaluation of cystic fibrosis lung disease.Am J Respir Crit Care Med2005;172:1246–52.
. A model for predicting life expectancy of children with cystic fibrosis.Eur Respir J2000;16:1056–60.
. A prognostic model for the prediction of survival in cystic fibrosis.Thorax1997;52:313–7.
. Wasting as an independent predictor of mortality in patients with cystic fibrosis.Thorax2001;56:746–50.
. Improvements of lung function in cystic fibrosis.Pediatr Pulmonol2002;33:263–8.
. Five- to seven-year course of pulmonary function in cystic fibrosis.Am Rev Respir Dis1976;114:1085–92.
. Longitudinal evaluation of bronchopulmonary disease in children with cystic fibrosis.Pediatr Pulmonol2003;36:230–40.
. Spirometric pulmonary function in healthy preschool children.Am J Respir Crit Care Med2001;163:619–23.
. Standards for infant respiratory function testing: what(ever) next?Eur Respir J2000;16:581–4.
. Early detection of cystic fibrosis lung disease: multiple-breath washout vs. raised volume tests.Thorax2007;62:341–7.
. Composite spirometric-computed tomography outcome measure in early cystic fibrosis lung disease.Am J Respir Crit Care Med2003;168:588–93.
. Structural airway abnormalities in infants and young children with cystic fibrosis.J Pediatr2004;144:154–61.
. Pulmonary disease assessment in cystic fibrosis: comparison of CT scoring systems and value of bronchial and arterial dimension measurements.Radiology2004;231:434–9.
. Computed tomography correlates with pulmonary exacerbations in children with cystic fibrosis.Am J Respir Crit Care Med2005;172:1128–32.
. Progression of lung disease on computed tomography and pulmonary function tests in children and adults with cystic fibrosis.Thorax2006;61:80–5.
. Progressive damage on high resolution computed tomography despite stable lung function in cystic fibrosis.Eur Respir J2004;23:93–7.
. Bronchiectasis: comparison of preoperative thin-section CT and pathologic findings in resected specimens.Radiology1995;195:649–54.
. An automated approach to quantitative air trapping measurements in mild cystic fibrosis.Chest2003;123:1655–63.
. Quantitative air-trapping analysis in children with mild cystic fibrosis lung disease.Pediatr Pulmonol2004;38:396–405.
. Thin-section CT in patients with cystic fibrosis: correlation with peak exercise capacity and body mass index.Radiology2006;240:236–45.
. Cystic fibrosis: scoring system with thin-section CT.Radiology1991;179:783–8.
. Cystic fibrosis in children: HRCT findings and distribution of disease.J Thorac Imaging1996;11:27–38.
. Cystic fibrosis: CT assessment of lung involvement in children and adults.Radiology1999;213:537–44.
. Evolution of CT findings in patients with cystic fibrosis.AJR Am J Roentgenol1999;173:81–8.
. Cystic fibrosis: when should high-resolution computed tomography of the chest be obtained?Pediatrics1998;101:908–13.
. Estimation of cancer mortality associated with repetitive computed tomography scanning.Am J Respir Crit Care Med2006;173:199–203.
. Dose reduction for CT in children with cystic fibrosis: is it feasible to reduce the number of images per scan?Pediatr Radiol2006;36:50–3.
. Computed tomography dose and variability of airway dimension measurements: how low can we go?Pediatr Radiol2006;36:1043–7.
. Lungs in infants and young children: improved thin-section CT with a noninvasive controlled-ventilation technique—initial experience.Radiology1999;212:588–93.
. Estimated risks of radiation-induced fatal cancer from pediatric CT.AJR Am J Roentgenol2001;176:289–96.
. Estimating cancer risks from pediatric CT: going from the qualitative to the quantitative.Pediatr Radiol2002;32:228–34.
. 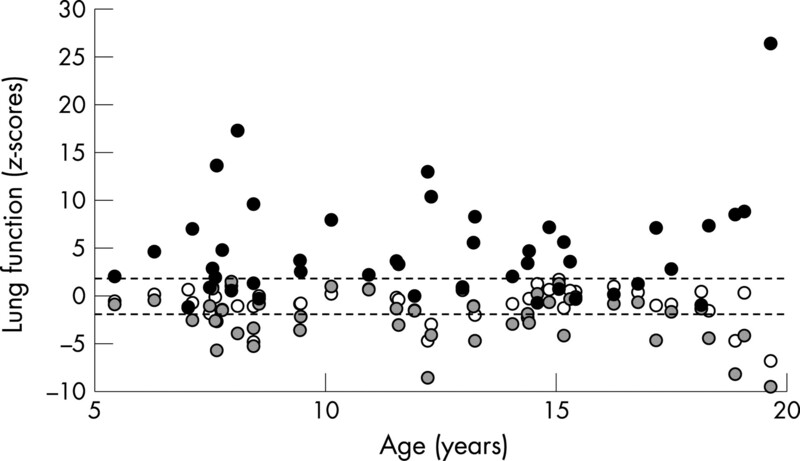 Lung function in children with pneumonia. With special reference to distribution of inspired air and regional lung function.Scand J Respir Dis1968;49:185–201.
. The volume of trapped gas: a new and sensitive test for the detection of exercise-induced bronchospasm in children.Acta Paediatr Scand1978;67:583–9.
. Moment analysis of multibreath nitrogen washout in young children.J Appl Physiol1985;59:274–9.
. Fast real-time moment-ratio analysis of multibreath nitrogen washout in children.J Appl Physiol1985;59:1137–44.
. Early morphologic changes in the lungs of asymptomatic infants and young children with cystic fibrosis.J Pediatr2004;144:145–6.
. Air trapping at CT: high prevalence in asymptomatic subjects with normal pulmonary function.Radiology2003;227:776–85.
. Bronchiolitis obliterans syndrome in heart-lung transplant recipients: diagnosis with expiratory CT.Radiology2001;218:533–9.
. Nitrogen single breath test, flow-volume curves and spirometry in healthy children, 7–18 years of age.Eur J Respir Dis1980;61:275–86.
. Reference values for lung function tests in men: regression equations with smoking variables.Ups J Med Sci1986;91:299–310.
. Reference values for lung function tests in females. Regression equations with smoking variables.Bull Eur Physiopathol Respir1985;21:551–7.
. Peripheral airway involvement in CF and asthma compared by inert gas washout.Pediatr Pulmonol2007;42:168–76.
. Conventional high-resolution CT versus helical high-resolution MDCT in the detection of bronchiectasis.AJR Am J Roentgenol2006;187:414–20. Funding: Pim de Jong was supported by a British Columbia Lung Association Fellowship in Respiratory Medicine and a Canadian Institute of Health Research/Michael Smith Foundation Transplant Research Training Award.